When you are an egomaniac, promote yourself. I learned several years ago that EGO was just an acronym for Easing God Out. There is no room for faith, spirituality, or another higher power when you believe you are God. I believe Barack Obama is an egomaniacal narcissist, unfortunately. His latest power grab comes not in domestic policy but foreign. He plans on appointing himself the head of the United Nations Security Council, where he also set the agenda for Thursday, September 24. The council, which next meets Sept. 24, deals with a host of global challenges, including nuclear non-proliferation and nuclear disarmament. The Obama administration hopes to use the month-long appointment to emphasize a departure from the Bush administration’s strategy of pursuing its own unilateral policies through the council.. The head of the council is usually assigned to a delegate or the UN Ambassador, not the president of the United States. Many are arguing that this is unprecedented and unconstitutional, however, it technically is only the former and not the latter. There are valid arguments against heading up such a council, such as, how would this not be a conflict of interest, or cause a divided loyalty issue? Will Obama side with America or with the UN? This could also stretch him too thin. Has anyone seen a manager or supervisor who couldn’t delegate work? Usually the team and the manager struggle to reach their objectives. At this juncture in America’s history, there is too much that needs to be focused on, rather than Obama’s apparent goal to run the world. The narcissism is just so incredibly absurd that I can only imagine a larger drop in his approval rating once more of the public catches wind of this. Could you imagine the outcry if Bush did something like this? This seemingly innocuous language has two profoundly disturbing features. First, UN documents indicate that the Security Council is currently dealing with over 100 issues. While “non-proliferation” is mentioned, “disarmament” is not. Similarly, a UN Secretariat compilation “forecasting the Council’s program of work” for the month of September — based on prior activities and requests — lists non-proliferation specifically in relation to Iran and North Korea and does not list disarmament. But in light of Obama’s wishes, a tailor-made subheading will likely be adopted under the existing entry “maintenance of international peace and security.” The new item will insist on simultaneous consideration of nuclear non-proliferation and nuclear disarmament and make no mention of particular states. To add insult to injury and almost clear up this administration’s intentions, which resemble those of Carter’s, Obama has decided to scrap the missile shield project originally set to be constructed in Poland and the Czech Republic. The most “transparent” and humble president in our nation’s history also left the Senate out of this major foreign policy decision. McCain, ranking Republican on the Senate’s Armed Services Committee, told The Hill the White House never notified his committee and that he was unaware of the decision until he was notified Thursday morning. 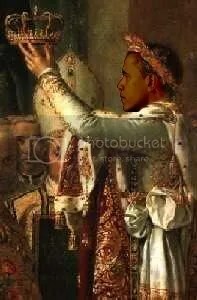 I don’t think hail to the chief will cut it anymore – time to redo a version of “God Save The Queen” for King Obama.